Are Oranges Good for You? What Kinds of Fruit Prevent Asthma? Most people know that fruit is good for you. But some may not know that oranges have been proven especially effective in preventing certain types of disease. Oranges are high in vitamins and minerals that boost your body's natural defenses and help fight against heart disease and anemia. However, they also have a high acid content which may irritate some preexisting conditions. Before you decide whether oranges are the best fruit to supplement your diet, talk to your doctor about any possible complications or side effects. An average orange contains approximately 70 mg of vitamin C, which is over 75 percent of the recommended daily value. This vitamin acts as an antioxidant that inhibits the damage caused by free radicals, which are oxidizing molecules formed by natural processes, such as digestion. Vitamin C also aids in the body's healing process and helps to form and repair skin, tendons, ligaments and bones. Oranges are also a good source of dietary fiber, vitamin B1 and folate. While scientists are still uncertain of the exact mechanisms that make oranges and other citrus fruits effective for decreasing the risk of cardiovascular disease, it appears that folate plays a major role. Folate reduces the presence of homocysteine, which is toxic to the vascular walls. The American Heart Association recommends that heart patients "should be strongly advised ... to get enough folic acid and vitamins B-6 and B-12 in their diet." The Linus Pauling Institute cites studies in which greater intake of vitamin C correlates with lower rates of coronary heart disease. It is possible, therefore, that Vitamin C and folate together may help reduce your chances of having heart-related illnesses such as heart attack and stroke. Some forms of anemia are genetic, but others are caused by a lack of proper nutrition. Oranges can help prevent against these forms by providing folate, which your body needs to produce red blood cells. The vitamin C in oranges can also increase the absorption of the inorganic iron found in plants, which can supplement the more easily absorbed meat-based iron. Proper iron levels allow your body to manufacture hemoglobin, which is the molecule that delivers oxygen to the rest of your body. Oranges are acidic fruits, which can complicate some existing disorders, including heartburn, or acid reflux, in which your stomach acid moves into your esophagus, causing chest pain. Oranges may also cause abdominal pain in people who have peptic ulcers. In rare cases, the chemical salicylate contained in oranges can cause an allergic reaction that may trigger asthma, eczema, sinusitis, hives or an upset stomach. 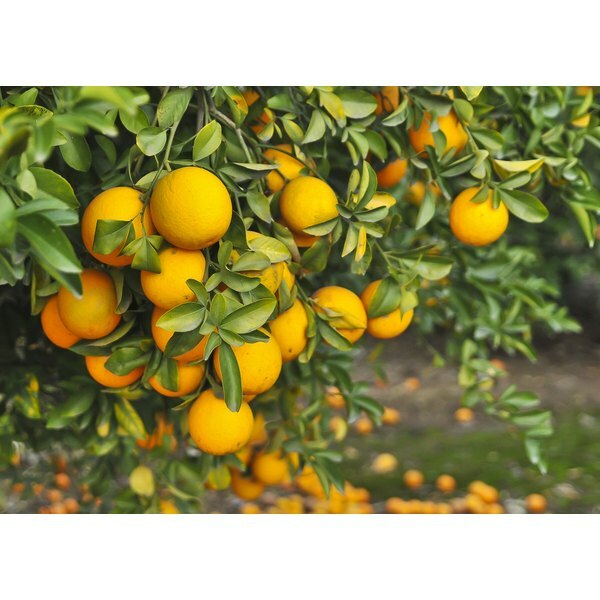 In addition, some oranges and orange products may contain traces of pesticides, which are toxic to the human body. Children are especially vulnerable because they consume more oranges and orange juice in proportion to their body weight than adults do. According to a study done by the U.S. Department of Agriculture, approximately 1 percent of oranges contain this residue, which may cause delayed development, lung and nervous system damage or cancer in large quantities.